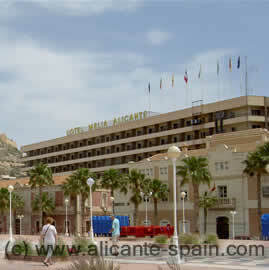 Travelers to Torrevieja are usually flying in either at Alicante airport or Murcia San Javier airport. If you are coming into Alicante airport the new Torrevieja Quickair bus is a very cheap and speedy way to get you to your holiday destination. Running several times a day, the bus connects downtown Torrevieja ( central bus station ) with Alicante airport. Bus runs all days of the year – including Sundays and Festivities at same timetable! Price for a one way ticket is EUR 6.75 – the return ticket is EUR 13.50. Tickets can be bought directly with the driver. The bus-line Alicante airport to Torrevieja is a direct bus connection from the downtown bus-station in Torrevieja ( Estación de autobuses de Torrevieja, Calle del Mar, 50 ) and Alicante airport. 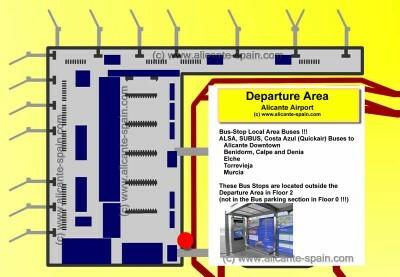 The bus stop at Alicante airport is located just outside the Departure Area ( Level 2 ). When you arrive at arrivals, take the lift UP to the Departure Area and leave the building. The bus stops for the Torrevieja ( Quickair ) bus is located at the end of the terminal building. Details on the busstop for the Torrevieja bus to Alicante airport are here. Important! Do NOT follow the “bus” signs DOWN to Level-2 , as this is the bus stop area for charter buses only! In case your flight arrives too late for the latest bus or you travel with children, I would advise to hire a car or take a taxi for Alicante airport to Torrevieja. The current bus connections between Murcia’s San Javier Airport and Torrevieja are no better. Here a choice is to take the latbus airport bus from the Murcia Airport to the downtown Murcia bus station Unfortunately this bus runs currently (2010) only 3 times during the evening hours. From Murcia’s central bus station you can take another bus to Torrevieja. A lots of back and forth for a rather short straight distance. Again, whatever you choose to do, for the around 35km distance between Torrevieja and Murcia San Javier Airport, I would not advice to take a trip to Murcia downtown and back to Torrevieja (probably a total of trip of 100km). Any alternative transport method, like car rental, a taxi or a private bus shuttle is certainly the better choice. We are still hoping that the authorities will one day understand the need for simple, reliable and frequent bus services from Alicante and Murcia airport to Torrevieja.